Municipal Services Department in Dillingen-Lauingen use GPON technology to pump control. The growing expansion of passive GPON architecture (Point-Multipoint) in access networks is a hard fact. Most of people associate the GPON technology (GPON – Gigabit Passive Optical Network) with ISPs, which provides the Internet, IPTV or VoIP services. However, GPON could be also used in other less popular applications. Municipal Services Departments deal with distributing water, sewerage systems and also collecting the waste. In May 2016 Municipal Services Department in Dillingen-Lauingen in Germany, has requested an inquiry to connect pump stations with sewage farm control through fiber links, preferably passive. The main aim was to lower the costs by resigning from active nodes, but also to obtain a high level of system reliability. Taking above-mentioned purposes – GPON technology using passive splitters – was the best solution. Thus, GPON option was successfully chosen for this project. 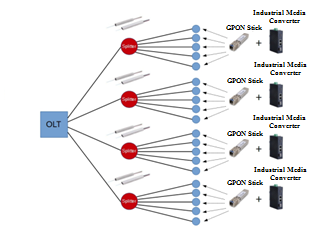 During GPON implementation – OLT devices, were applied. As an example in the installation OLT device was used, which could theoretically connect 1024 ONTs through 1:128 split. Thanks to small dimensions of device and 1U size, OLT could be assembled in every rack. At the beginning of installation, 1:8 splitters with attenuator were used because the high level of optical power could damage the receivers due to low distance to pump station (12km). Having used OLT device, the ONT profiles has been created. Therefore, it’s important to note that instead of classic ONU devices the GPON Stick was used. This is a really small ONT device in transceiver form, which complies with industry requirements (range of temperature, voltage, humidity). GPON Stick could be inserted into for instance industry converter, so then this converter would be the GPON end device. The pump station, which was connected through GPON with sewage farm control was controlled by SPS (Surface Pump Systems). The real speed of transmission of SPS data was slow comparing with other application of GPON technology, however still very significant. That is why SPS unit constantly checks the availability of station and alarms if one of them does not respond within a few seconds. The GPON implementation encompasses: the monitoring of the pump station control, the water level from raining pools, the amount of provided and siphoned off water – this kind of information was through fibers transmitted to Controlling Municipal Services Department Centre in Dillingen to process, control, record and archive. 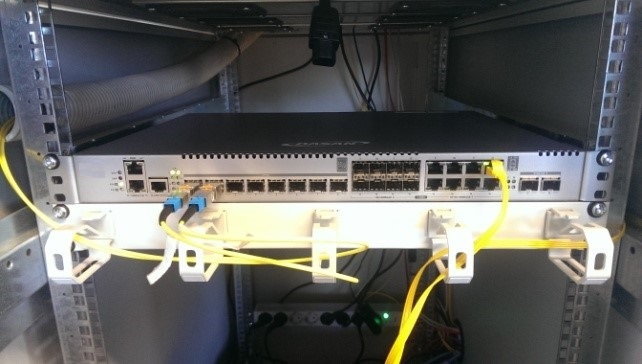 The using of GPON technology lets Municipal Services Department in Dillingen-Lauingen minimalize the costs of connection and causes the high level of reliability of installed system.